Registration will only be open from Apr 11, 2019 (at 12:00 PM) to Apr 22, 2019 (at 5:00 PM). It's now 4:01 PM on Apr 24, 2019. Registration process: Please sign-up for the event here. We will create a separate event for the payment after the sign-up deadline. You always wanted to be on stage? You enjoy acting but never had the chance to actually perform? Or you're just looking for a new challenge this summer? 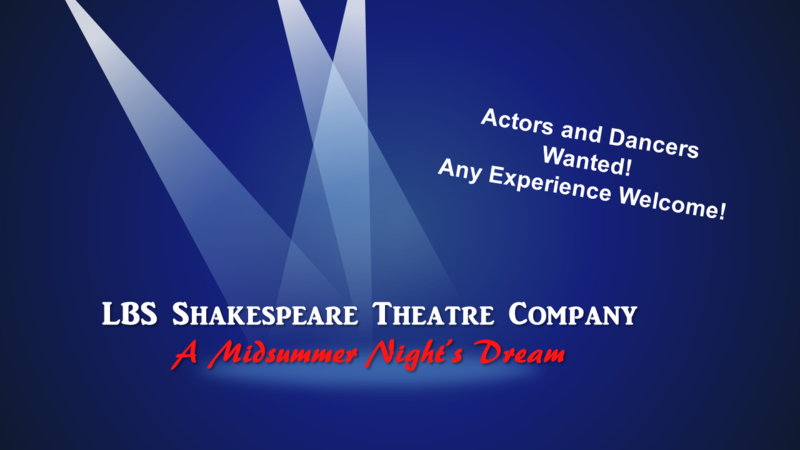 Join our Shakespeare Theatre Company and rehearse Shakespeare's A Midsummer Night's Dream, culminating in a full-scale show! Shakespeare might sound a bit intimidating but once you start working with his plays, you will discover they are a lot of fun! There might be an additional rehearsal on Saturday, 18 May, or Sunday, 19 May. Please keep 23+24 May free for the show! The play will be directed by our amazing John Lightbody, who is a professional actor and drama instructor and has been teaching at LBS for many years. We welcome any level of experience – if you are a seasoned actor or new to the craft! For this play, we are also looking for a couple of dancers or actors who enjoy dancing! If you take a theatre company class like this with a final performance at one of London’s amateur acting schools, you will pay about £400. Our price is £260 only to cover cost. Take the opportunity to do something amazing this summer!